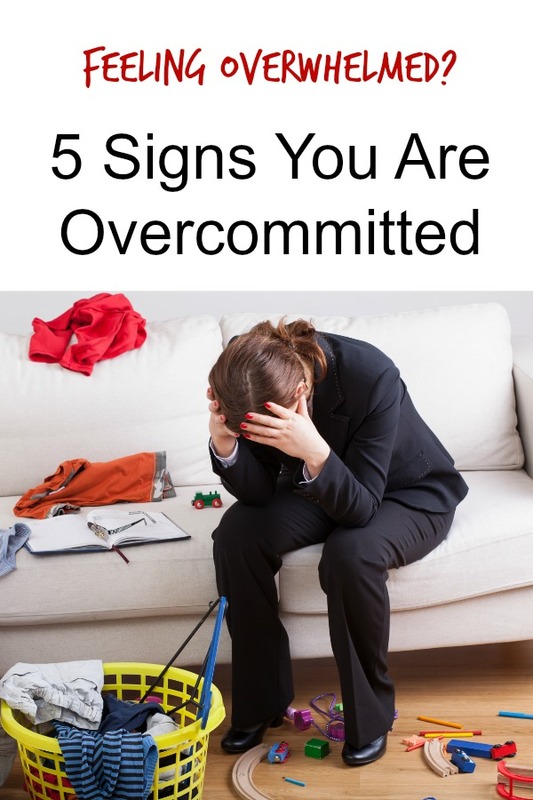 Feeling Overwhelmed with Life: Are You Overcommitted? Home » Parenting • Womanly Things » Feeling Overwhelmed with Life: Are You Overcommitted? Perhaps you don't know if you are really overcommitted or if it is just the way life should be? Since we all have these moments, it is time to acknowledge and share tips for figuring out if you are truly overcommitted or just having a bad day. We just don’t know when to stop. We continue to work, nurture, parent and love until our backs break. This is a problem, ladies. We are not meant to become Stepford Wives or drones; we are flesh and blood creatures with limitations. I know that may come as a surprise to some of you, it sure shocked me. We are working ourselves into the ground, moving closer and closer to the edge of insanity, and it isn’t fair. So many of us are feeling overwhelmed with life, and somehow, we've been led to believe this is the normal way things should be. We may feel like we are doing the right thing, and it makes sense: after all, you don’t quit until the work is done, right? The part nobody tells you is that the work is never done. Life is a constant stream of tasks, flowing into infinity. It is natural. What is not natural is to continue to take all of those tasks on yourself. It can be difficult to tell when we have committed to too much, but there a few ways to tell. Let’s talk about them. Have you ever just felt like something is wrong, and you can’t put your finger on it? That nagging suspicion that there is something missing. That can be a sign that maybe you aren’t living your life for yourself, but your to-do list. Your friends seem to ALWAYS need something, and it is driving you crazy. If everyone is getting on your nerves, it may not be them, it could be you. When you are just feeling overwhelmed with life, irritation happens much easier than it should. No matter how much sleep you get, you wake up feeling tired. You drag yourself through the day. At the end of the day you collapse into bed and hope to wake up feeling better, but you don’t. This is a sure sign of having committed to too much. If you find yourself thinking several times per day, “everyone wants something from me,” this could be a sign that you are taking on too many tasks. If every second of your time is spent trying to play catch up on unfinished tasks, you have too many of them. Ever have the feeling that your time doesn’t belong to you? If everything you do is for someone other than you, that is completely out of balance. You are not the savior of the world, and that’s OK.
No matter how badly you may want to take on everything that comes your way, you have to also leave yourself enough time to do some things for yourself. This is not a problem that is going to solve itself. It won’t even get solved overnight. You could drop everything on your calendar and go cold turkey, but the truth is that it would only cause you more stress in the end. Feeling overwhelmed with life isn't how things are supposed to be, but you don't want to add to the stress by burning bridges or creating problems among friends and family. You’re going to have to pause, admit to yourself that your life has become unmanageable and get it back under control. You owe that to yourself because being overcommitted is EXHAUSTING. Go get some rest, girl. Take a break, and sit down with your calendar to figure out priorities and manage commitments so you can be the best you possible.